Stock #20A57 Model #84071 On Sale through 9/30/19. Stock #20A58 Model #84072 On Sale through 9/30/19. Stock #20A59 Model #84073 On Sale through 9/30/19. Stock #20A60 Model #84074 On Sale through 9/30/19. Stock #20A61 Model #84075 On Sale through 9/30/19. Transform your conference room or office with the Enlighten™ Black Glass Dry Erase Board, a sophisticated, sleek writing surface. Translucent glass surface provides a modern element to any environment. The special finish provides a smooth writing surface that will not ghost or stain. The durable tempered glass accepts dry/wet-erase markers, grease pens, etc. 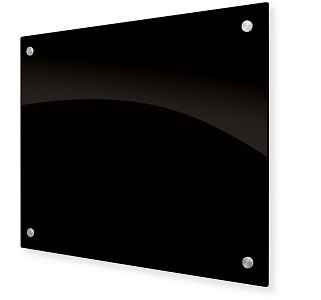 Stylish stainless steel standoffs mount the glass board 1" off the wall, adding depth and dimension.